The roads of feudal Japan are rife with brigands, but for Ogami Itto and his son, the roads are deadly. 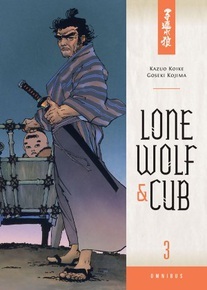 Shogunate agents and Yagyu Retsudo's assassins dog their every step, but each step brings the Lone Wolf and his Cub ever closer to Yagyu... and to vengeance. Story by Kazuo Koike and Art by Goseki Kojima.